At the national Waka Ama championships held at Lake Karapiro, six under-10 Otaki boys came of age. Waka Ama racing is a sport where grandmothers, grandfathers, mums, dads, and their kids can come together to race competitively. There were over 3000 paddlers from clubs all over New Zealand, with visiting crews from Australia, Papua New Guinea and the Cook Islands. 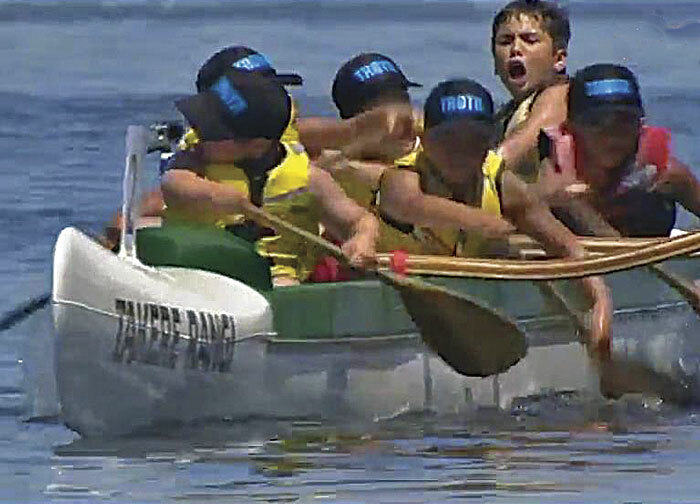 In the Midget class (under 10yrs) there were 36 teams competing, but it was the 200 vocal supporters from Te Rau o te Rangi Ki Otaki Waka Ama Club who were cheering the loudest as their boys “The Regulators” paddled their outrigger canoe to victory. Nationals ranked well outside the top ten based on their times at the Regionals. But in a testament to Roa’s coaching abilities and seemingly endless reserves of patience, the “most mischievous team in the club” came good when it mattered. So good in fact they won Gold in both the 500 metre and 250 metre event where their time of 1 min 25 secs was the fastest ever recorded on Lake Karapiro! With coverage of the races live on Maori Television the boys were also interviewed by T.V One after their first victory which lead to an interesting predicament for the next final. After a brief “in-house” discussion, the boys had decided they weren’t going to win the next race because they didn’t want to become too famous! But luckily after some tricky negotiations and bribery they were back on track and the rest as they say is history. Their success has become a source of pride for the local Waka Ama club who had 120 paddlers compete at the Champs this year — up from only 6 in 2014. Having to borrow waka and getting only limited access to a small lake behind Stresscrete has proved difficult at times . In spite of this they have managed to not only grow but become highly competitive, with several teams ranked inside the top eight at this year’s event. And as the boys from the Regulators have shown, that even without all the resources and training facilities you can still become world famous…. in Otaki.